An unaltered photocopy of your DD-214, WD AGO, NAVPERS, NG or other military issued document clearly displaying your award of the Army Achievement Medal. The Army Achievement Medal was established on March 2, 1981, by Secretary of the Army John O. Marsh, Jr. The Army Achievement Medal has been in effect since August 1, 1981. The Army Achievement Medal may be awarded to members of the Armed Forces below the rank of colonel who, while serving in any capacity with the Army in a noncombat area, distinguish themselves by outstanding achievement or meritorious service, but not of a nature that would warrant the award of an Army Commendation Medal. The Army Achievement Medal is worn after the Joint Service Achievement Medal and before the Prisoner of War Medal. Additional awards of the Army Commendation Medal are denoted by oak leaf clusters. 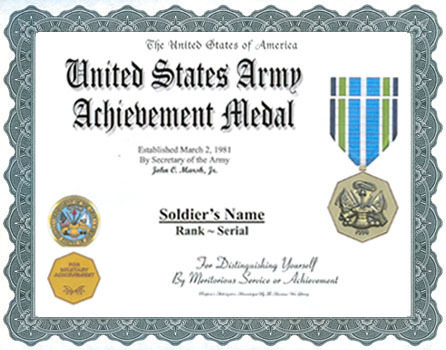 The Army Achievement Medal was designed by Jay Morris and sculpted by Donald Borja, both of the Army's Institute of Heraldry. The identity of the first recipient is unknown. In the center of a bronze octagon one and a half inches in diameter (one angle at the top), the elements of the Department of the Army Seal. The shape of the medal was adopted to distinguish it from all other Army decorations, and the Army Seal denotes the authority under which the award is given. Centered in three lines in the upper half, the words FOR MILITARY ACHIEVEMENT. At the bottom of the medal there is a double spray of laurel, which represents achievement. The ribbon consists of a central stripe of blue with a white center stripe. The blue is bordered by white, green, white and is edged in green. 1. Description: A bronze octagonal medal, 1 1/2 inches in diameter, with one angle at the top centered. On the obverse is a design consisting of the elements of the Department of the Army (DA) plaque and the date "1775" at the bottom. On the reverse, in three lines, are the words "FOR MILITARY ACHIEVEMENT" above a space for inscription and below there are two slips of laurel. 2. Ribbon: The ribbon is 1 3/8 inches wide and consists of the following stripes: 1/8 inch green 67129; 1/16 inch white 67101; 1/8 inch green; 1/16 inch white; 9/32 inch ultramarine blue 67118; center 1/16 inch white; 9/32 inch ultramarine blue; 1/16 inch white; 1/8 inch green; 1/16 inch white; and 1/8 inch green. 3. Criteria: The Army Achievement Medal is awarded to any member of the armed forces of the United States, or to any member of the armed forces of a friendly foreign nation, who while serving in any capacity with the Army in a non-combat area on or after 1 August 1981, distinguished himself by meritorious service or achievement of a lesser degree than required for award of the Army Commendation Medal. The Army Achievement Medal will not be awarded to general officers. a. Decoration (regular size): MIL-D-3943/102. NSN 8455-01-127-7338 for decoration set. NSN 8455-01-128-2438 for individual medal. b. Decoration (miniature size): MIL-D-3943/102. NSN 8455-01-128-2439.
c. Ribbon: MIL-R-11589/280. NSN 8455-01-128-2440.
d. Lapel Button: MIL-L-11484/135. NSN 8455-01-128-1849. 5. Background: a. As part of the Army Cohesion and Stability Study (ARCOST) of 1980, a recommendation was made to establish the Army Achievement Medal, Overseas Service Ribbon, Army Service Ribbon, and the NCO Professional Development Ribbon. On 18 February 1981, MILPERCEN requested TIOH initiate action to develop the recommended awards. Designs were prepared by TIOH and forwarded to MILPERCEN on 18 March 1981. 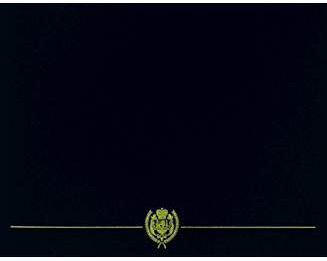 On 10 April 1981, the Secretary of the Army approved establishment of the decorations recommended by the ARCOST group. On 13 April 1981, the DCSPER approved a design which had been submitted by TIOH and directed development be initiated. b. Order of precedence and wear of decorations is contained in Army Regulation (AR) 670-1. Policy for awards, approving authority, supply, and issue of decorations is contained in AR 600-8-22.